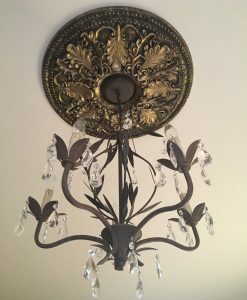 Tim and Katie from Canton, Michigan sent in gorgeous pictures of their completed ceiling medallion project. 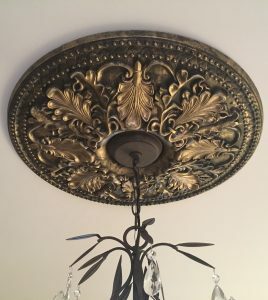 They purchased a couple different ceiling medallions, but to keep this post brief, the one we chose to focus on was the Ekena Millwork Ashley Ceiling Medallion. Delivered in a primed white, the two of them decided to paint it. Katie, an interior designer, went ahead and chose the antiqued bronze and flat gold paint for the medallion. It looks stunning. Perfectly matching the lighting fixture, the newly added medallion truly ties the room together.